The WordPress ecosystem is chock-full of opportunity. And of course, we all know what an amazing piece of software WordPress is. It’s the reason why many readers of this blog have chosen to build their businesses around it. But when it comes to building your WordPress business, sometimes it’s the awesome functionality and extensibility of WordPress itself that ends up being our biggest downfall. As a WordPress business owner – no matter whether it’s design, development, maintenance or content marketing, it’s important to differentiate between working with the tools of your business and working on your business. WordPress is a tool. Yes, it’s an amazing tool, but without the structure of a business behind it, it’s all but useless. We’re going to cover another round of awesome Podcasts in this post, but with a twist. Instead of podcasts that are focused on WordPress, we’re going to cover podcasts that are capable of helping you grow your business. Zero to Scale is a great Podcast about bootstrapping startups to $20k and beyond. This podcast gives you an awesome behind the scenes look at what’s involved on starting and scaling a business to a significant level of recurring revenue. The shows hosts are Greg Hickman and Justin McGill both of whom have some decent street cred behind them. Their experience is entirely applicable to anyone who is trying to build a business in the digital marketing or WordPress space. One of the best things about this podcast is the level of honesty, you’ll hear about lots of wins, but you’ll also hear stories of lost customers, sneaky competitors and how to pivot when the opportunity arise. This one needs no introduction really, but just in case you’ve never heard of Brian Clark or Copyblogger, here are the podcast details. Not too long ago (Mid October of 2015) Copyblogger re-branded under the name of Rainmaker Digital. The New Rainmaker podcast is one of the most popular on iTunes. Most episodes are a convenient 18-35 minutes with a few outliers – just about right for the drive to work. You’ll hear lots of discussions about the pros and cons of different business models, the value of content marketing and a ton of valuable information about what’s working and what’s not in the world of digital marketing. Not to mention some great interviews mixed in to boot. One of the best places to learn about how to build your WordPress business is by listening to other successful entrepreneurs. The Web Agency Podcast by Ben and Mat Newton features a wide array of interviews with digital business owners. Honestly, there aren’t many topics that aren’t covered in this podcast with over 90 episodes to pick from. Conversion rate optimization, selling SEO services to clients, web design and development plus work life balance and more are all included. Bootstrapped Web is another must listen to podcast about building an online business. The hosts, Brian Casel, and Jordan Gal both run service-based businesses in the digital space. Most people are familiar with Restaurant Engine, the productized website design agency for restaurants which was recently sold by Brian. If you listen to past episodes you’ll hear about both the process of selling his business and the transition to Audience Ops, a startup that provides done-for-you content marketing services. Jordan Gal runs two productized businesses. Cart Hook, an abandoned cart email service for eCommerce stores and Banyan Tree Digital, a done-for-you sales funnel solution. This is another podcast that’s very similar to Zero to Scale – two entrepreneurs that are not unlike anyone else who’s working to bootstrap a small business and learn as they go. Chris Ducker has been putting out content since 2010 when he launched his Virtual Business Lifestyle blog. Now rebranded under his own name and Youpreneur.FM, the podcast features lots of well-known guests. There are a few core themes that run through this podcast. The first centers around outsourcing and virtual assistants. Equally valuable are the discussions that surround building a personal brand – something Chris Ducker has managed to do a great job of. Also worth mentioning are the frequent reminders that as entrepreneurs, we need to be careful about working ourselves into an early grave. Life balance and spending time with family are just as much an indicator of success as anything else. The mental game of business is what often separates two otherwise equally skilled entrepreneurs. You won’t hear much about web design and development in this Podcast by James Schramko and Ezra Firestone, but you learn a heck of a lot about what it means to think like an entrepreneur. Each episode is focused around a single word: Habits, control, willpower, timing, culture and marketing to name a few. Almost every episode contains information that won’t just help your business, it will help you become a better business owner and a better entrepreneur. As well, James Schramko is the man when it comes to SOPs. If you’re at the stage in your business where you’re looking to grow and systemize, this is someone you want to learn from. If you’ve been around the web for any length of time you’ll probably be familiar with Corbett Barr and Chase Reeves who are two of the original founders. This is a top-rated podcast for online entrepreneurs. It’s also one of the few business podcast that will actually have you laughing at some point in virtually every episode. The list of topics covered is vast. Everything from running a side-business while holding down a full-time job to freelancing experiences to small business marketing. This is definitely a podcast worth checking out if you’re interested in learning and being entertained at the same time. The host of Rough Draft, Demian Farnworth is also the chief content writer for RainMaker Digital. While this podcast is not your usual 30-60 minutes of marketing mayhem that you’d expect to hear after listening to some of the other podcast in our list, it still serves an important purpose. Rough Draft will teach you how to communicate with and market to your clients and prospects more effectively. We featured a post about storytelling in 2014 on this blog and it was again a topic of discussion in Divi Nation Episode 3. If you’re producing content for your WordPress business or wondering how you might be able to improve the copy on your website, this is the podcast you should be listening to. The older episodes are a little shorter in nature. Starting in October 2015, Demian switched to a longer format after taking a short break to recoup. One of the easiest ways to learn about running a successful freelance business is by listening to the experiences of people who have forged the path ahead of you. 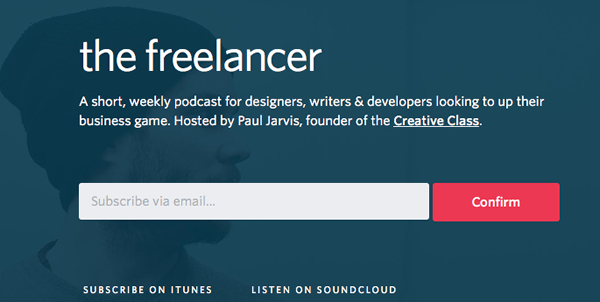 The Freelancer is a podcast by Paul Jarvis who has run his own successful freelance business for what is an eternity in freelance years. With big name clients and a decent size waiting list, you can make the assumption that he’s doing a thing or two right. Each episode is short and on point giving you an opportunity to learn something new and helpful in under 15 minutes. As a side note, if you enjoy this podcast, you can also head over to Invisible Office Hours and check out his other podcast. 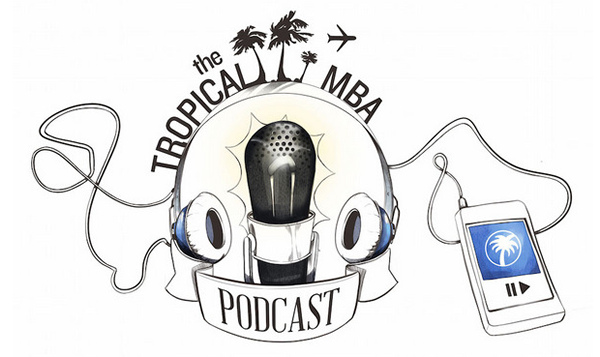 The Tropical MBA podcast is hugely popular with millions of downloads in over 100 countries. 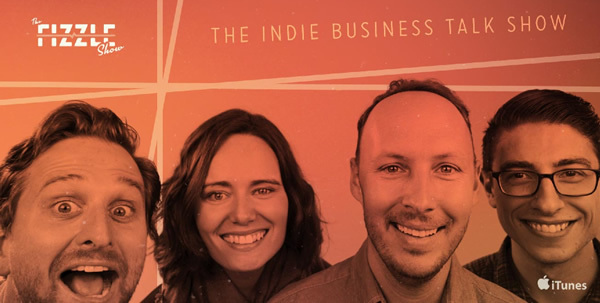 There is a new episode almost every Thursday and in most cases the focus is on building a location independent business and productized services. Almost every episode contains valuable insights from experienced entrepreneurs who have learned what is means to grow a business from scratch to well beyond coconut cash. Starting with episode 307, hosts Dan and Ian are detailing the launch of their new business LTV Machine. Anyone starting their own service based business should make this podcast a must listen to. We’ve covered ten awesome auditory experiences in this post. After listening to a lot of different podcasts, these are some of the ones that have proven themselves as worth returning to time and time again. One thing that all of these podcasts have in common is the fact that every single one will help you to step away from working with individual tools (like WordPress) and turn your attention towards the process of running your business. 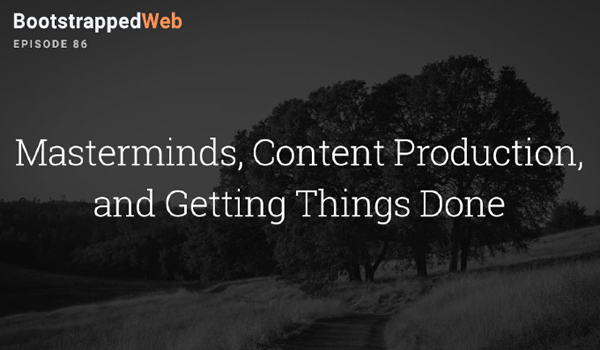 If you’re running your own WordPress business, there is a good chance that you’re busy. It’s important that as entrepreneurs, we step away from working in our business just long enough to take a birds-eye view. Catch a glimpse of how well things are actually working. There aren’t enough hours in the day to listen to all these podcasts, but it would be well worth your time to pick two or three and tune in each week. It’s a lot easier to learn from the mistakes and experiences of someone else than it is to forge the path alone every time. If you have a favorite business podcast that you think is worth listening to, please share in the comments below. Great list but I think you are missing the only one that matters in my opinion and that is Smart Passive Income by Patt Flynn and his daily podcast Ask Pat. Unlike the others here Pat gives you a true working template upon which you can build a successful online business…. without all the hype! Through the years he has become very successful but maintains his humility. I have used his model to build two successful online businesses. His original content is as valuable today as it was when he started his podcast years ago which says a lot about the evergreen nature of his content: start at episode 1 and by the end you too can build a successful online business. But it takes hard work and relentless dedication!! I love the chit chat and banter in the show. Helps replace some of the office banter I lost when I started working from home. Joe – very cool of you to include Zero to Scale in your roundup. Appreciate the feedback! You forgot to mention Divi Nation Podcast! I know it is only 9 episodes old so far, but it has lots of great insights, tips and products that gold for any Divi website developer. Keep it up, Elegant Themes!